Jackie's work focuses primarily on employment and business-related matters, including employment discrimination, harassment, wage and hour, and union contract matters. Jackie represents a variety of employers, including manufacturing and industrial companies, television stations, hospitals, and universities, in both federal and state courts as well as before government agencies such as the Equal Employment Opportunity Commission, the Office of Federal Contract Compliance Programs, the National Labor Relations Board, and numerous state and local human rights commissions. Jackie’s practice includes advice on affirmative action, union avoidance, reasonable accommodation, hiring practices, personal services contracts, employee discipline and termination issues, and on compliance with the Americans With Disabilities Act and the Family and Medical Leave Act. She drafts comprehensive employee handbooks, human resources guidelines, and affirmative action plans. She has been invited by employers on numerous occasions to speak to groups of employees and/or supervisors on topics ranging from union avoidance to sexual harassment. 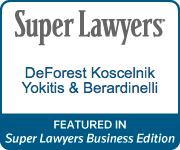 In 1994, Jackie joined Walter DeForest in founding DeForest & Koscelnik, now DeForest Koscelnik Yokitis & Berardinelli. Jackie began her legal career as an Associate with Reed Smith Shaw & McClay.